I can't believe two months passed by so quickly. When i first arrived in Nepal a year ago, i knew i would be coming back again and again in this country. So it was not surprising that after the new year celebration in Manila, i was on transit in Kuala Lumpur, Malaysia bound for Kathmandu, Nepal. I still had the same guide book with me, which i bought for only 500 rupees at Pilgrims Bookstore in Thamel. A week ago, i learned of the unfortunate fire accident that affected a couple more stores beside the infamous book shop. Nepal didn't change a thing. It's still the same old country that i fell in love with. It's sharp contradiction to big, first world countries is one of the reasons why i love this country so much. I've written about the awful air pollution, the dirty alleys filled with so many things you will cringe seeing back at home, the unfathomable discipline of the people falling in line at entrances and bus parks. Yet, i have accepted everything there is to hate in this country. So, i guess this is love, huh? I lied down at one of the cushions inside the Garden of Dreams in nearby Thamel. I paid 200 rupees to get inside, one of the few tickets i needed to pay in this country. I lied in there, away from the hustle and bustle of manic Thamel. It was quiet, more often weird to think that only minutes away, i was almost hit by a taxi cab. Not that its his fault, because he has no more space to drive around in. I thought i've never seen so many couples in one day. There's too many love birds expressing their love for each other. It's always inspiring to see love flourish. Earlier while i was looking for the toilet, i chanced upon a young couple kissing so passionately, i felt embarrassed for interrupting them. Valentine's Day passed by me nonchalantly. 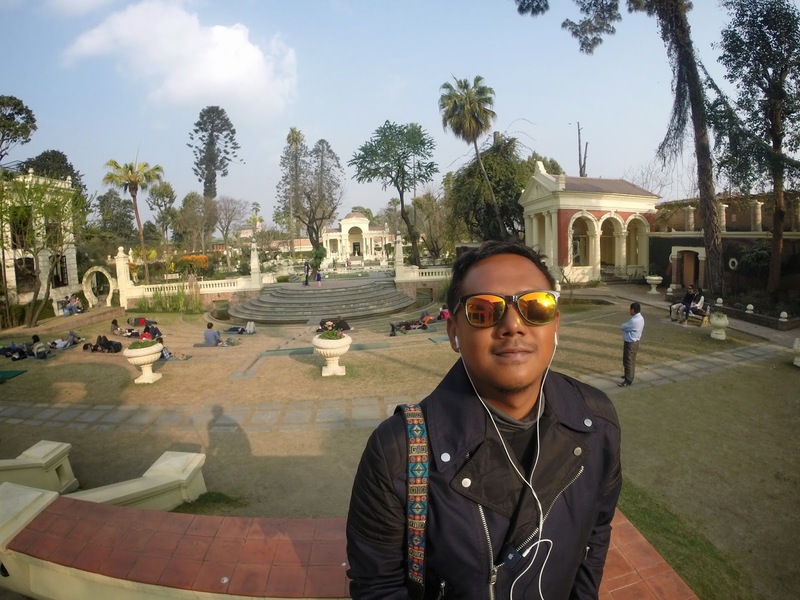 I was walking around Kathmandu last February 14th. While 90% of the people I've seen were all in the company of their loved ones,i was there enjoying my steak at a fancy cafe. There are moments when i feel lonely in Nepal, without another hand to hold, or a warm body to embrace. But all were just some passing thought. I never felt sad because i was on a very long engagement with this country. I spent about three hours inside the park. I've seen so many couples come and go, but i never left. I always thought that these moments do last forever. And in a year or two, i will always remember these instances, so precious and dear to my heart. Garden of Dreams is probably the most beautiful park I've ever seen. It's not too big, and not too crowded. It's very relaxing and convenient to go to. The park opens at sunrise and closes at sunset. I was there before dusk. It's hard to grasp how i felt there. At one point, i felt happy and relieved that my adventurous trip to the mountains is over. And falling on a cliff or in a gorge is all but a bad dream. But at the same time, i felt sad that i am a day away from leaving Nepal. But during my quiet contemplation here, i realized it's okay to be sad. Who on earth would be happy knowing this journey of mine is already coming to an end? Nobody. I will be back to Nepal for sure. I've kept my promise once. Hell, i can keep one more. Later that day, i went back to buy stuff for my family. I've bought a couple of shirts, accessories, and a handful of trinkets. I went back to the same shop by the junction to buy stuff for the home. Days ago, i met this young man in the shop. I've told him about my trip last year, and how i bought so many stuff for the home. This year, i came back to get some more. I promised him i will be back before i leave. After negotiating a good price for a ceramic brass plate, a couple of masks, carved wooden boxes, and a lot more Hindu signages, i thanked the manager for a good transaction. I saw the young man again, and showed my shopping bag. His smile was from ear to ear. I came back to my hotel, and saw Shiva. We enjoyed the dinner of Dahl Bat. So by this time, i could assume the saying Dahl Bat 24 hour Power. It was not a tearful night as i suspected. More so, it felt like i was going on a vacation. It felt weird that i felt like going on a short trip wherein fact i will be coming back home to the Philippines. Yet, i take everything in stride. This is how i felt, so be it. He then asked me one important question that i almost forgot all this time. Shiva in his usual curious face, "How many kilos do you have for check in baggage?". Completely stuck with the words... kilos and baggage. I said to myself, "Oh,no! ".